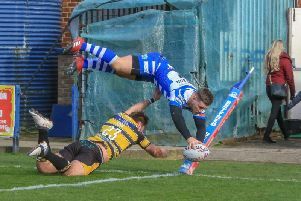 Halifax scored two tries in the final seven minutes to secure a crucial Championship win over Hunslet at the Shay. Richard Marshall’s side, who had led 20-18 at the break, had lost Steve Tyrer, Adam Robinson and Jacob Fairbank to injury and were trailing 24-20 to a Vinny Finigan try as the clock ticked down. But captain Scott Murrell finished off fine approach play from Ben Kaye and Dane Manning and then converted to put them 26-24 ahead, before full back James Saltonstall sealed victory with a long range solo effort, Murrell on target with the final kick of an end-to-end game. Neither side had started the game particularly brightly after the exertions of Good Friday, but it was the home side who took the lead when Tyrer and Murrell carved out a sharp chance for winger Alex Brown, who touched down in the corner. Tyrer’s conversion drifted wide and with the home side making far too many errors it was Hunslet who scored next, the Leeds players Rob Mulhern and Jimmy Watson scoring back to back to put the visitors 12-4 ahead after 20 minutes. Halifax’s response was swift, if not always decisive, with a trio of quickfire tries from Ben Heaton, Chris Taylor - who profited from great work from Luke Ambler and young full back Saltonstall, and Tyrer leaving them 20-12 ahead. But the Hawks scored virtually on the final play of the half, with a brilliant pass from another Rhino, Jimmy Keinhorst, creating a walk in for Briscoe in the corner, Simon Brown kicking his third conversion of the game to leave the contest poised at 20-18. Finigan then put the Hawks ahead, Brown again on target, but Halifax were not to be denied.